One of my earliest memories of even seeing football was in the 1970s when as a kid I would go across the street and play with my friend Cody. His parents were big football fans and they’d have the Cardinals on whenever they could. I just remember those white on red uniforms. His dad would be sitting in the living room watching the Cardinals, and I remember watching Terry Metcalf do his thing. 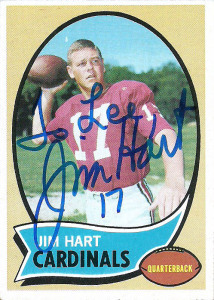 Jim Hart’s career spans a rare 3 decades of football. 1966 to 1983 seems like a long time and it is, especially when you go undrafted. Hart ended up impressing the Cardinals brass who signed him after a tryout. He’d take over the starter duties soon thereafter, and while Jim’s teams struggled early on, he’d flourish under Don Coryell and the team became known as the Cardiac Cards for their comeback wins and exciting contests. His best season came in ’74 when Jim was named the NFC Offensive Player of the Year. He also earned Second Team All-Pro. 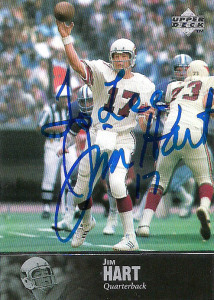 A 4 time Pro Bowler, Hart earned the honor from 1974-1977, and was given the Whizzer White Player of the Year for his charitable contributions in 1975. In 1981 the Cardinals drafted their second franchise quarterback- the also vastly underrated Neil Lomax. The writing was on the wall, and Hart was slowly being phased out. Jim played for the Cards through 1983. He’d spend one largely forgettable season with the Washington Redskins in ’84 before retiring. 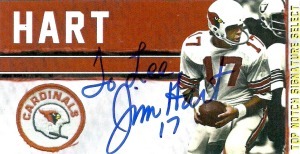 While Kurt Warner is now considered the Arizona Cardinals best QB, I’d argue that Hart was the best St. Louis quarterback that the franchise has seen- but those heroics are largely diminished or forgotten by a fanbase that didn’t care or know who he was during Hart’s heydays. Jim is considered an excellent TTM signer.